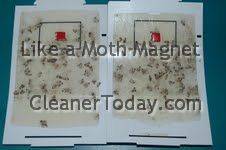 Once you have confirmed that you are dealing with a food moth infestation (Identify types of moths), continue with the clean up and then deploy pheromone moth traps to get rid of adult moth pantry bugs. Home defense begins by discarding any moth infested foods that show signs of clumping, or threads. Clean moth larvae webbing from under the edges of cans, in shelf support holes, and around all trim. Moth traps are the safer way to get rid of adult moths without poisons, pesticides or sprays that could harm your food, family or pets. 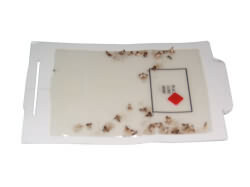 Natural Pheromone Moth Traps are safe, easy to use, long lasting and effective. The key to trapping moths with a pheromone moth trap is that the pheromone lure (red square in pictures below) makes male moths think a female moth is nearby. The male moth follows the scent of the moth pheromone lure, and gets caught in the moth trap's sticky glue board. One less male moth to mate with, and 100 fewer moth eggs to turn to moth larvae worms and eventually fewer adult moths. Effective Pantry pest moth control that leverages the moths own instincts to resolve a moth infestation! What about a Moth Killer Spray? Our initial reaction to pantry moths is to go the hardware store and buy a moth killer spray. Stop and think about the risk of a pesticide being sprayed on the shelves where you keep food... Ultimately, a pantry moth spray is a risk we just don't recommend. Cleaning the pantry with soap and water is no more dangerous than washing dishes, and will accomplish the goal of Moth Larvae and Cocoon Clean Up. Use of moth traps is best illustrated a few pantry moth trap pictures. Note the final pantry moth photo showing the trap in action. 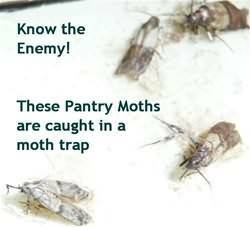 Know what pantry pest moths look like! individually wrapped red squares then use the Moth Trap flat or folded. 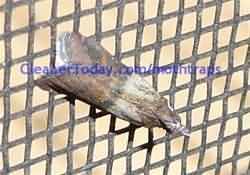 Natural Pheromone Lures draw moths Acting like a Moth Magnet, Getting rid of moths! You can view additional pictures at : Pantry Moth Photo or read more customer Pantry Moth Trap Reviews or browse Able Catch Elevated Moth Traps. I had to find out how get rid of moths after loosing a nightly battle swatting them as they flew in front of the flat screen. At first I looked for a pantry moth spray but I was worried for myself and my children at the idea of spraying a moth killer poison in the cupboard. I found a completely organic and natural solution to the moth problem. Pheromone moth traps use the moth's own chemical signals to draw them into a poison free trap. Based on reviews there were a variety of traps to select from, with varying results. I used the moth traps and they have worked great. I can now watch TV without a moth swatter sitting next to the remote control. What makes Moth Traps work? Which moth traps kills moths faster? Do moth pheromone traps work? What will kill moths without moth repellent poisons? Can moth traps get rid of moths in the house? What are kitchen moths attracted to? What are the steps to getting rid of little brown pantry bugs? In homes the Indian meal moth typically is brought in products from the grocery stores. Typically called pantry weevils or pantry bugs, food moths have an appetite for stored food products (people and pet foods) such as: flour, cereal, dry pasta, dry pet food, powdered milk, corn starch, crackers, spices, breads, bird seed, dried nuts and fruit. Pantry pest moths become troublesome when these foods are stored in paper containers and go unused for extended periods of time, resulting in a moth infestation and food waste. The pupal indian meal moth larvae stage (this is when the pantry pest takes the form of a small whitish gray worm) can take place away from the infested food in corners or cracks in the cupboards or packaging. The length of time to complete the pantry moth life cycle varies greatly, depending on temperature, relative humidity, and the quality of the food supply. Most types of stored food moths can complete several generations in one year. Moths will breed continuously as they usually exist in favorable conditions, but during the summer months the breeding cycles are faster. The time to use moths traps is in their adult stage. Which type of moth are you dealing with? When you are considering moth infestation solutions, making sure we are talking about the right type of moths is the first step. Of course, you don't need to be an Lepidopterist (Butterfly and Moth Expert) to figure out which appropriate entomological products (moth traps) you might need to capture the moths flying around your kitchen. OK. Enough of the fancy scientific identification names. Really, it's pretty simple to narrow down what type of moth you are dealing with. The major moth categories you need to be concerned about are outdoor large butterfly moths, Cloth Moths and the food moths (pantry moth, and flour moth from the indian meal moth family). A butterfly moth is typically found OUTDOORS, and is, well, the size of a butterfly. These moths can be found in orchards, and buzzing around light fixtures at night. Typically moth traps with names like 'Skinner moth trap, Robinson Type or Heath moth traps are associated with catching these moths, and studying them. These moth traps are large, and not for effective for getting rid of pantry moths. The clothes moth is one of two indoor moths (the other is a Lepidoptera: Pyralidae: Phycitinae ). The clothes moth doesn't actually eat clothing as an adult. Clothing moth larvae are the one who do the damage. Unfortunately, we don't have any moth larvae traps, but you can just use moth balls or a natural moth repellant. If the moth you find is near clothing or a closet, then it isn't a food / pantry moth. This is the general category of food moth we are talking about getting rid of! The food moth is no larger than a pen cap, and is a mottled brown moth found in stored foods, pantry cupboards, and even pet foods. When resting their wings are tightly folded making the moth no bigger than a fire-fly. The moth's wings are identifiable with the head side being a pale grey even tan and a the tail end resembling a rust or bronze color. You might hear the same moth being referred to as different types of moths: indian meal moth, flour moths , pantry moths , mealy moths, moth flies or a dozen other names, but the bottom line is that if the moth is indoors, and near food its a Meal Moth. Whether your moth infestation is in the pantry, cupboard, or garage you can effectively start getting rid of moths with a pheromone moth trap!